Bana Alabed, the young Syrian girl who has become an internationally recognized symbol of civilians’ suffering in her country’s ruthless civil war through a Twitter account run by her mother, has made it out of eastern Aleppo along with other children evacuated by international aid groups. According to the president of the Syrian American Medical Society (SAMS), a Washington D.C.-based non-profit organization, Alabed arrived to the countryside west of Aleppo on Monday with “many” other children from the former opposition enclave of eastern Aleppo, where thousands of rebels and civilians are still believed to be awaiting evacuation. The mass evacuation of civilians was resumed Monday morning after a tumultuous weekend, with a fragile cease-fire appearing to hold. 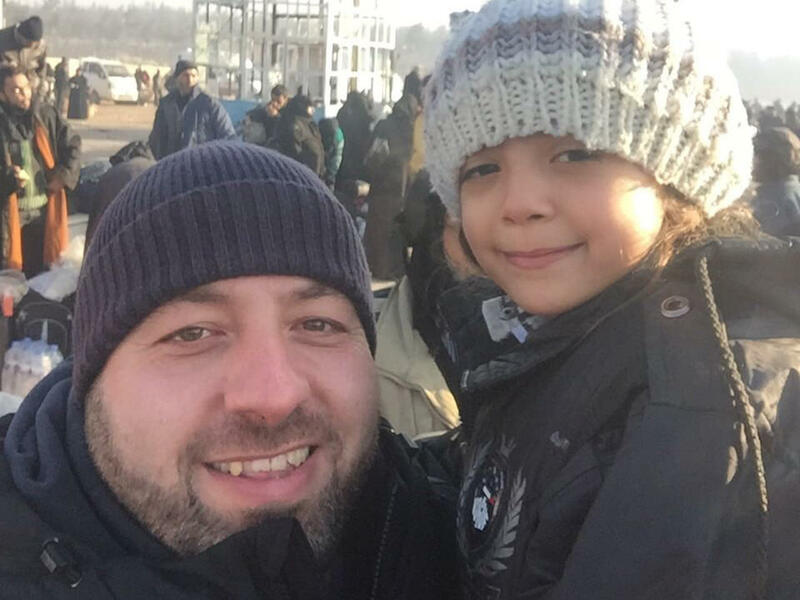 Dr. Ahmad Tarakji, the head of SAMS, tweeted a photo of Bana Alabed in the arms of a medical worker Monday morning. Other Syrian activists and aid workers on the ground tweeted similar photos with the little girl, who appeared to be in relatively good health. Later Monday the Associated Press released video showing Bana and her mother Fatemah together at the site run by aid agencies. Fatemah Alabed’s media background gave her the prowess to capture attention and widespread sympathy via Twitter for her and her daughter throughout their ordeal, as their neighborhood was bombed for weeks by Russian-backed Syrian government forces. “We created our Twitter to tell all the world what is happening there. We are happy because our voice reached all the world. We are free,” the mother said, adding that while she was happy to be out with her daughter, she was sad as she has now, like an estimated 2 million other Syrians, on the verge of becoming a refugee. Syrian dictator Bashar Assad’s regime has dismissed the mother and daughter as pawns and propagandists for the opposition forces in the country, all of which the regime describes as “terrorists,” including the moderate rebel groups that have received backing from the U.S. and its allies. The photos and videos posted by Fatemah of her daughter revealed the horror of life in eastern Aleppo, under constant bombardment and with little to no humanitarian aid getting into the area since Assad’s offensive to retake the city began in earnest more than a month ago. By Friday last week, tense cease-fires had given cover for an estimated 8,000 to 9,000 civilians and rebel fighters to be evacuated from eastern Aleppo, crammed into any vehicle that moved, with no choice but to start again in unknown territory. Those holed up in eastern Aleppo were given a choice under the evacuation deal brokered last week; board buses bound either for government territory, or other rebel enclaves to the west of Aleppo. There have been reports that dozens of men who boarded those buses previously have since disappeared without a trace. CBS News correspondent Elizabeth Palmer reported that some of the evacuees did find comfort, even joy, as they were reunited with friends they weren’t even sure were still alive. But for most, the evacuation has been both heartbreak and shock. At the very least, people were making it out. Until Friday afternoon, when it all came -- again -- to a saddening halt as someone resumed shelling. Each side accused the other of opening fire, and we still don’t know the truth. But almost immediately the Red Cross and Red Crescent withdrew their ambulances and the evacuation stopped. Rebels torched at least six government buses in villages outside of Aleppo on Sunday, scuttling hopes that mass-evacuations could resume hastily this week. CBS News Holly Williams reported Monday morning that evacuations were back underway, and there were no immediate reports of major violence. Williams said more than 100 wounded evacuees from Aleppo were brought to Turkey over the last five days for treatment, according to Turkish officials -- including nearly 50 children. U.N. children’s agency UNICEF said Monday that an entire orphanage in eastern Aleppo had been evacuated. “This morning, all 47 children trapped in an orphanage in east Aleppo were evacuated to safety, with some in critical condition from injuries and dehydration,” UNICEF regional director Geert Cappelaere said in a statement, according to the Reuters news agency. There was also a new diplomatic push at the United Nations, aimed at not only getting the civilians and rebels out of eastern Aleppo, but at bringing international monitors into the area in an effort to avoid “mass atrocities” in that and other besieged areas. After hours of negotiation between Russia, the U.S. and France on Sunday, the U.N. Security Council forged a compromise which, if approved, will allow the U.N. to send monitors to oversee the evacuation of civilians and fighters and ensure their protection if they decide to stay in war-torn Aleppo. The Council decided to hold the vote on the measure for Monday morning, to allow member states time to consult with their capitals on the details of the deal. If the compromise passes the Security Council vote on Monday, there are still hurdles for civilians trying to escape eastern Aleppo given the myriad armed factions controlling local areas on the ground -- as illustrated by the bus burning incident on Sunday -- but as CBS News’ Pamela Falk reports, it would at least illustrate some level of compromise between Moscow, Washington and Paris over how to protect Syrian civilians.